Laser cutting and the making rooms experience.
. The Making Rooms is a Independent community interest company and open to the public 2 days a week where businesses, artists, inventors, students, children and just about everyone can come and use the facilities and Technology available. Its a place where creativity, technology and advanced manufacturing come together in a community facility for use to design and make anything from high-tech products and gadgets to toys, artworks, home decorations and t-shirts. I had to adjust my images size in places as the pieces on the design were so intricate and fine that they would have just snapped. When the image was ready to print it was important to select the correct details into the Laser printer. Vectoring/cutting – I used 3mm Black, White and Clear Acrylic.. The black acrylic speed needed to be set at 25 with 100% power and 5000HZ frequency. File-Print-Properties-‘Combined’ for Rastering and Vectoring. Colour Mapping….Full Red=(R:255 G:0 B:0) True Blue (R:0 G:0 B:255) Speed 90, Power 20, DPI 600. Vectoring/cutting White Acrylic and Clear Acrylic 30 speed, 100 power and 5000HZ frequency. 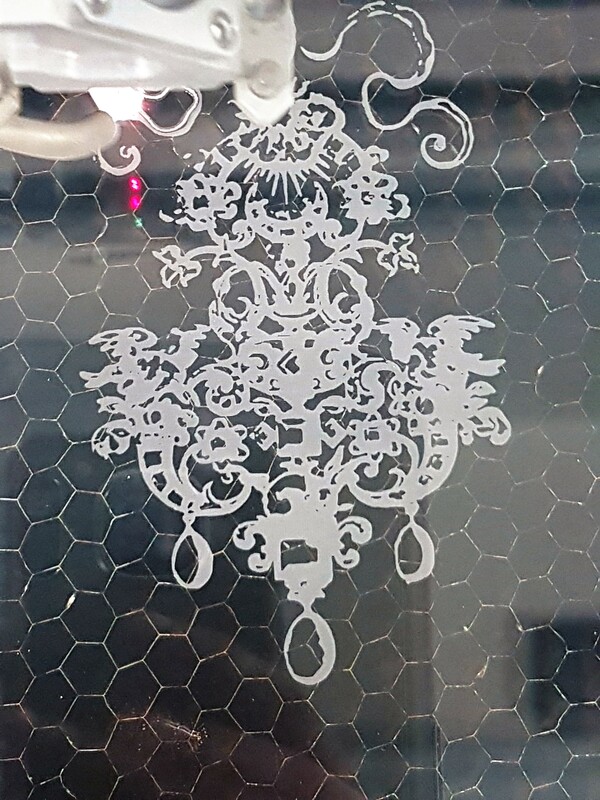 I had to repeat the vectoring for the clear Acrylic to cut the outline again as the first time it didn’t work and I didn’t want it to snap which it is quite easy to do with the details being so fine. next time I would like to see the results working with other materials such as wood or fabric. I would also like to try the 3D printer because that looks amazing.